This website is focused on the art scene of London and it aims to give information about art events and related activities in London. 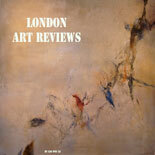 Addressed to art operators, London Art Reviews tries to express the uneasy artistic concepts in a simple manner, to catch the attention of art lovers and, possibly, to involve those who usually are not keen to art. Pages are related to different venues and events. A special page is dedicated to different art ideas to contribute to the debate and to stimulate creativity. If you fancy to participate to the website, please note support is welcome, but as a free contribution, as London Art Reviews is very newborn website, with no income. Any material, article or image is © copyright protected. Using is not allowed without permission.